Here in northwest Indiana, a lot of people spend their summer weekends at The Lake. 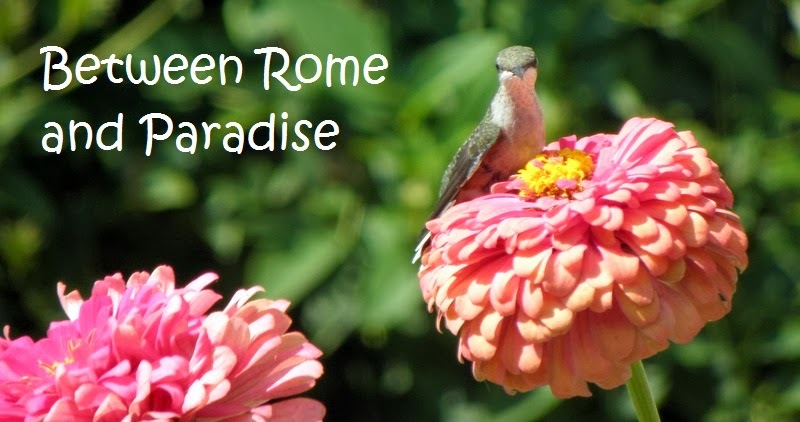 There is not just one lake, but many lakes, surrounded by everything from tiny seasonal cottages to multi-million dollar mansions. Those with access to one of these lakes usually spend their time on jet skis and other loud motorized water vehicles, all in the name of fun. Me? I'd rather hunker down in a 4-H building in the middle of nowhere to play with fiber. 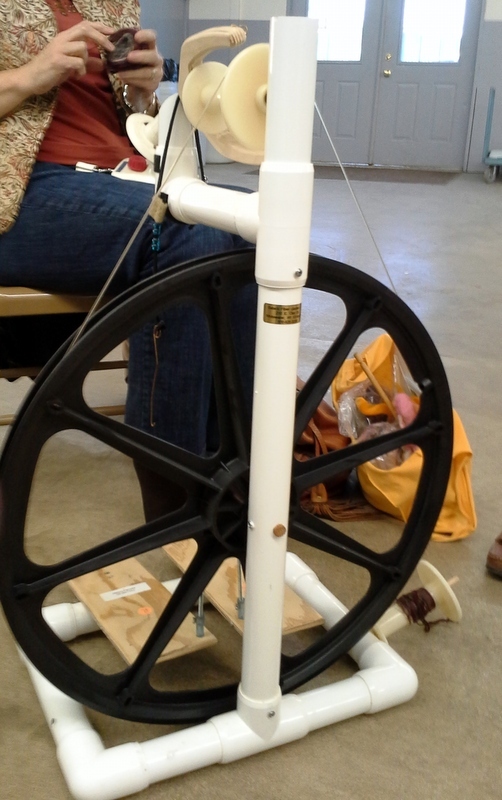 In the fiber blending class, I learned that I like drum carding better than hand carding. I also hogged one of the drum carders, blending almost all the sample fibers provided by the material fee. The colors did not come through in the photos below, but the fiber on the left is white with green angelica (fine tinsel) blended in, the one on the right a mixture of grays and pinks. Another sample is striped primary colors, but it is rather hideous. I was like a kid in a candy store, with a bit of mad scientist thrown in. It is not often that I am totally engrossed with a single activity, but this was one of them. 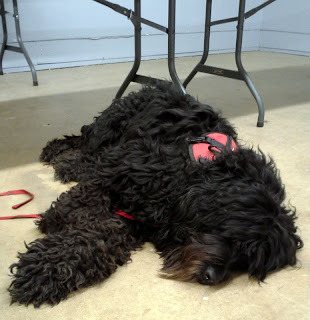 Oddly, not everyone in the class felt the same way. One woman even gave me all her fibers, insisting she would not use them, ever, even though she had plans to card fiber from her own animals. Between classes, I spun up some of my samples. The unspun sample below turned into a luscious raspberry yarn. Meanwhile, the weaving instructor tried to engage me in conversation. He needed no eye contact to rattle on, and eventually brought me a sample of alpaca to try. There are two kinds of alpaca, suri and huacaya. I had tried spindling suri before and found it frustrating to work with. This was huacaya and a dream to spin. Lovely cinnamon color, too. 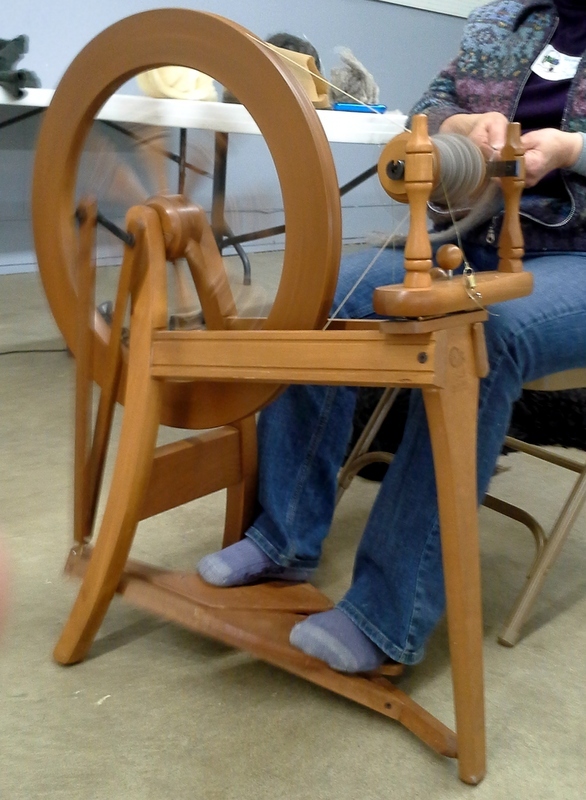 The spinning class consisted mostly of new-new spinners, a couple of which were there against their will. 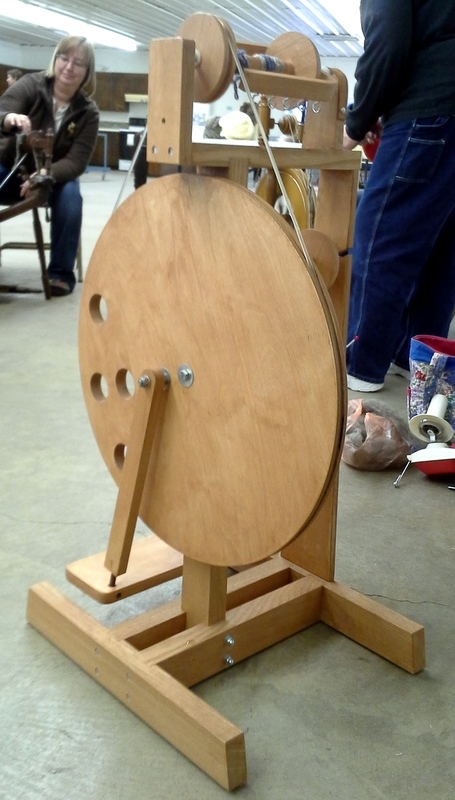 One's husband had asked her if she wanted a spinning wheel, and when she said no, bought her one anyway. By the end of class, she was planning to sell it. The other reluctant spinner had asked her husband for a loom, and since all fiber arts look alike to him, he bought her a wheel - made of PVC pipe and plywood. The instructor brought along a few wheels for those without. The one on the left was dizzying to watch - all it needs is some op art decals to make observers keel over. I was the most experienced spinner in the class, save one self-taught woman who brought a wheel and Franny, a service dog in training. 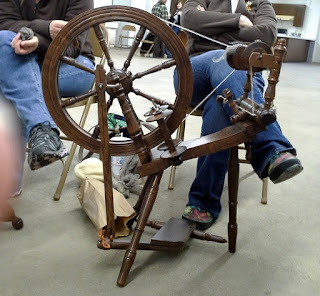 One thing I learned in this class was how to ply yarn from a center pull ball, much easier than plying off two bobbins, so I walked away with some actual yarn by the end of the day. 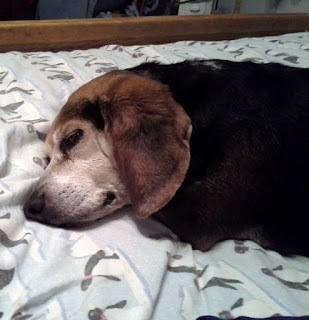 By the time I arrived home, I was dog tired, about as tired as Betsy after spending the day with my SO and his two cats. The only purchases I made from vendors at the fest were some handmade soaps, hand-dyed sock yarn, and extra bobbins for the wheel. I actually knew some of the vendors, and one recognized me from my last trip there, so now Portland is feeling like home. 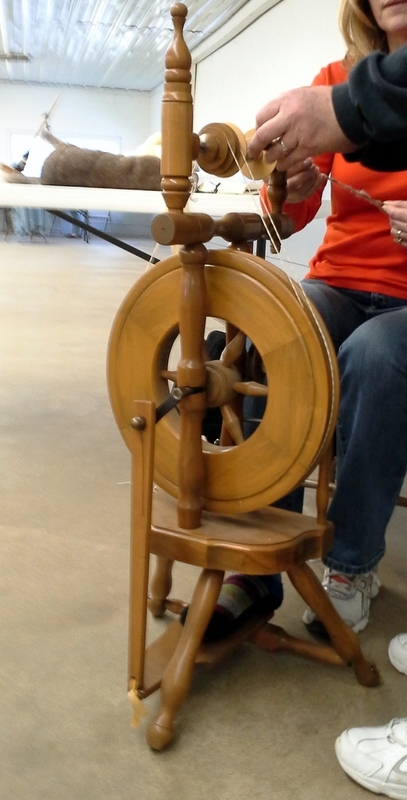 Next fiber arts festival: Kendallville, aka Kendalltucky. What a cool class! Those blue and pink spools look like cotton candy! I bet they would make beautiful sweaters! When is this ever going to end?! ?